You won't believe how easy it is to create this impressive dessert for your guests! Preheat oven to 350°. Grease an 8-inch square baking dish. To prepare the batter, place dry cookie mix in a medium bowl and add chocolate chips and walnuts. Toss to coat evenly. In a separate bowl, combine water, melted butter and eggs, then add to dry ingredients and stir to combine. Pour into prepared pan and bake for 30-35 minutes or until toothpick inserted in center comes out clean. Let cake cool completely, then slice in half to create 2 loaf shapes. Reserve 1 half for snacking and continue with recipe, or double the topping ingredients and create 2 baked Alaskas. Place prepared cake onto a tray lined with parchment or waxed paper. With an electric mixer, beat together the egg whites, sugar and salt on high speed until mixture is shiny and stiff peaks form. Working quickly, scoop the ice cream evenly over the cake in 3-4 large scoops, pressing firmly to remove air pockets. 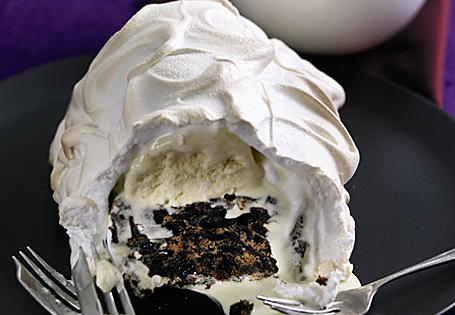 Spoon the meringue all over the cake and ice cream, making sure to completely cover the cake and ice cream and seal the bottom edges. Place the cake in the oven and cook just until the meringue starts to brown, about 6-8 minutes. Serve immediately. To simplify assembly, bake the cake one day ahead of time (steps 1-3). This recipe can be assembled ahead of time and kept in the freezer (steps 5-8) until ready to brown in the oven (step 9).